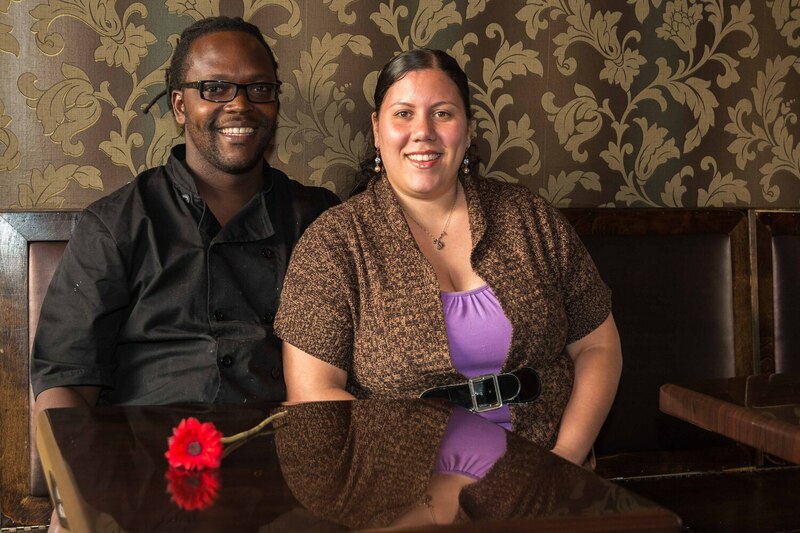 At Rose Petals Cafe, in the Germantown neighborhood of Philadelphia, co-founders Jania and Desmin Daniels are dedicated to creating unique and delicious food. “I’m Puerto Rican and my husband’s African-American, so we formulate a dinner menu that merges those things,” Jania says of their menu, which is inspired by a fusion of cultures. They also feature an extensive breakfast menu, with creative offerings like catfish and cornbread waffles. In addition to being a lounge in the evenings—for events like poetry readings—the restaurant has a community feel, and is open to kids and pets. The Daniels are parents of two young boys, so it was important for them to have a restaurant that is child friendly, with a safe and dedicated play area so parents can relax. “Community-building is something that’s in our core,” Desmin said, on the subject of opening the cafe. Jania and Desmin met in college, started a family, and had careers as teachers. They had thought about becoming business owners, but it just hadn’t come together yet. The catalyst for the Daniels’ decision to start their restaurant was a heartbreaking event: Desmin’s sister was murdered, a victim of domestic violence. Shortly after this, Desmin’s beloved grandmother also passed away. This past August, they celebrated the first anniversary of the restaurant’s opening, on the same day as their eighth wedding anniversary. Left: A signature dish of waffles with strawberries and chocolate syrup. Right: Sample-size portions of the food offered at a Germantown festival. Select a location carefully. “Picking a great landlord was difficult. The right space coupled with the right landlord. We are new and this is our first time doing this so we do represent something of a risk factor at this point, people are understandably cautious,” Jania notes. Ensuring the rent is affordable and the location is accessible are of the utmost importance, especially when embarking on a business venture like a restaurant, where the failure rate is high. Network and listen to customer feedback. Before Rose Petals Cafe had even opened its doors, the Daniels had an opportunity to get out into the neighborhood, share their offerings, and see some reactions. The experience proved to be invaluable as both a marketing opportunity and a chance for direct customer interaction. “We were at a festival in the neighborhood and we were invited to showcase a few of our items as samples. For us that was a huge milestone just because the community was really excited about us coming. It was also a really good promotional tool, we got great feedback and met wonderful people,” Jania states. Create a business plan. Jania had previously managed a food court establishment and has a strong business sense, so she knew that the first step in starting a business is to create a business plan. It helped the Daniels organize all of their thoughts and ideas about the business, in addition to having concrete financial information to show to potential lenders and investors. And the planning didn’t stop there.“It is such a working document. You’re always tweaking your concept and your idea,” she says. They learned that planning is an ongoing process, and when there are curveballs in your business, it helps to go back to your business plan and think things through. Jania uses the example of their decision to open the business in Germantown, a different neighborhood then originally planned. They had to adjust their plan to the new market, and new possible competitors. The Daniels and their successful restaurant business are a great example of what you can do with thoughtful planning, a clear vision, and strong motivation.